Brewing Update: Strawberry Banana Hefeweizen is Ready! 7.6.18 – Release Party! Let’s Monkey around! Monkey Berry is released! It will be shipping out in the next couple of weeks! 6.20.18 – Fruit is almost finished fermenting out! This beer is bananas! The flavors are coming along nicely and we should be looking to package in the next few weeks! Stay tuned! 5.30.18 – Uhoh! We hit a snag! Fruit is taking longer than we anticipated… The beer is happy as can be but it will have to wait for fruit. 5.16.18 – Ingredients have shipped! They should be here later this week. We will be adding strawberry and banana before you know it! 5.2.18 – BREW DAY!! 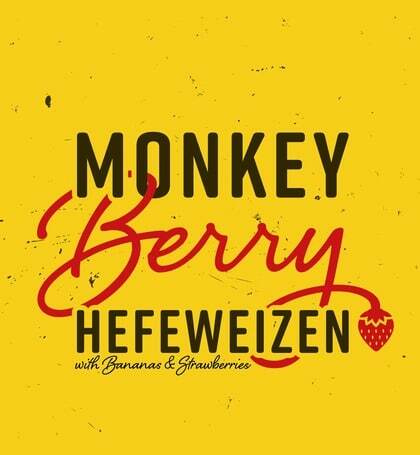 Monkey Berry Hefeweizen is being brewed! It was so much fun hanging out with Stephanie and brewing her beer. Fermentation should take a few weeks and we will be back for ingredient additions! 4.11.18 – Labels are moving right along! Text is well underway and concepts are in the works! Obviously, we are thinking something with a freaking adorable monkey will do the trick. The recipe has also been finalized and we are working on sourcing fruit! 3.28.18 – Monkey Berry Hefeweizen Wins! This is a Hefeweizen with strawberry and banana – Who doesn’t love just monkeying around! Congratulations, Stephanie on an awesome beer idea and for coming out victorious in a neck and neck voting round.